I live with a guy who could eat pizza every day and never get tired of it. While I do love a good pizza, I’m more that way with Mexican food. I’ve eaten Mexican food for days without losing my cravings for it. However, lately I’ve been all about the pizza, eating it for lunch, dinner and even for breakfast one day last week. We’ve been making pizza at home a lot lately. Seriously, we’ve made four pizzas within the past week! Best thing ever though because I can put whatever I want on the pizza without paying $1.00 extra per topping. You may remember my giant calzone epic fail pizza story that I told you about last week when I shared this Pesto Chicken Pizza Pasta recipe. Luckily, we haven’t had anymore of those fails again but I’ve been baking the pizzas in our oven. Pizza stone grill pizza is going to have to wait until A). We buy a thermometer for our kettle grill or B). Ken buys a Big Green Egg. Through trial and error, I’ve realized the key to baking a perfect pizza is to bake at a high temp for under 20 minutes. This way, the crust get fully cooked, the toppings perfectly heated and the cheese bubbly and slightly browned. I used to bake pizzas at 350 for 20 – 30 minutes but they were less than stellar. Good but could be better. Now I bake at 400 for 10-15 minutes. Turns out perfect every time. When we finally perfect grilling pizza on the pizza stone, I’ll be sure to share our method for that with you! 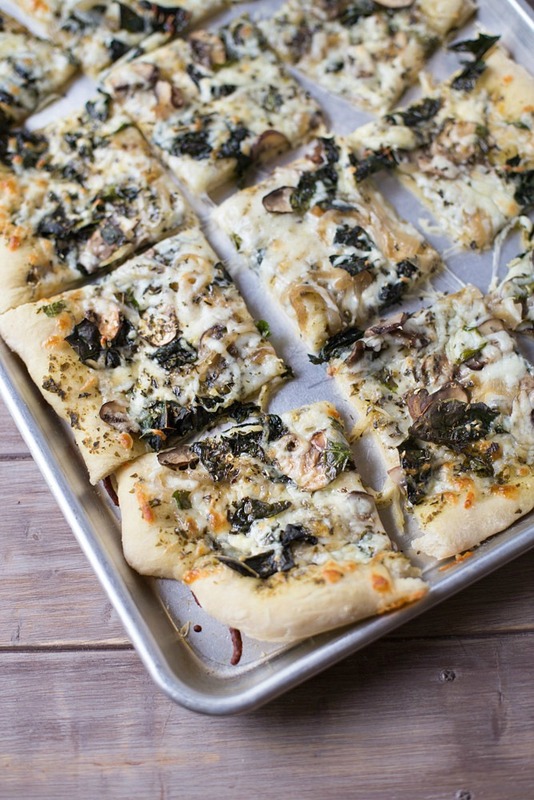 This veggie pizza that I’m sharing with you today is topped with kale, mushrooms and fresh basil. Instead of pizza sauce, I opted for using basil pesto. I first made this veggie pizza last weekend and it was so good, I made it again on Saturday so I could snap pics, write down proper measurement for ingredients and of course, eat said pizza. I did make my own pizza dough this time but it wasn’t very easy to work with so I’m not sharing the recipe for it. However, the first time I made this pizza, I used fresh store bought pizza dough and it was just as good. If you have your own favorite dough recipe, use that. If not, store bought dough will work too. Control the ingredients that are put into your pizza and save money when you make pizza at home. 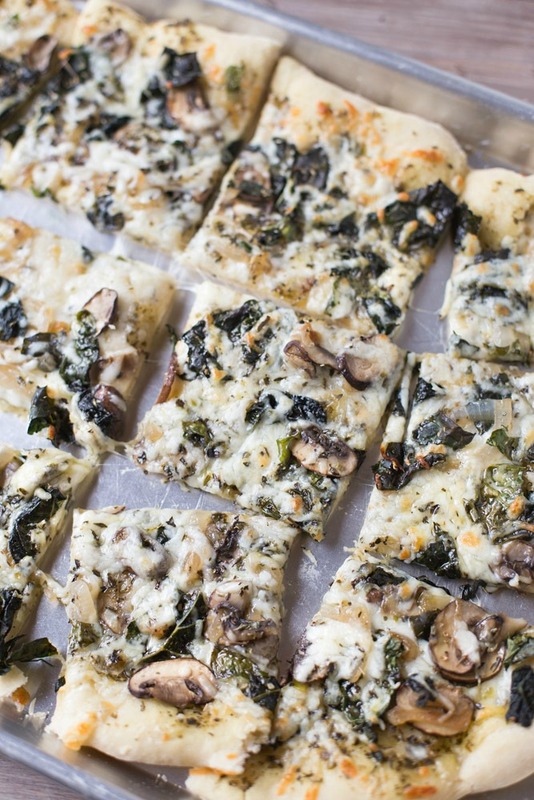 This Veggie Pizza is loaded with mushrooms, kale and basil. Basil pesto replaces traditional pizza sauce. Shredded Mozzarella and parmesan cheese and a drizzle of olive oil give the veggie pizza it's final touches. Prep your pizza dough. If you're making your own, follow your instructions to prepare. If using store bought, follow the instructions for allowing the dough to rise. Once the dough has risen, from into your desired shape (round or rectangle - I alternate between the two, depending on which pan I'm using). Spray your pizza pan with cooking spray. Distribute evenly and wipe away any excess with a paper towel. Place the dough on the pan and carefully stretch and form, if needed, taking care not to tear the dough. Poke holes in the dough with a fork. This will prevent bubbling while the pizza is baking. Spread the basil pesto evenly over the dough and set aside. Cook the onions, mushrooms and kale. Heat a medium sized skillet over medium heat. Add the wine, mushrooms and kale and cook until the wine has dissolved, about 3-5 minutes. Remove from the heat and set aside. Top the pizza. Evenly sprinkle 1 C of the mozzarella cheese over the basil pesto that's on the pizza crust. Evenly distribute the kale, mushroom and onion mixture over the cheese. Then evenly distribute the torn kale leaves. Top with the remaining ½ C mozzarella cheese, the Italian seasoning and then drizzle with the olive oil. Evenly sprinkle the shredded parmesan cheese over the top of the pizza. Place the pizza in the oven and bake for 10-15 minutes or until the cheese is bubbly and slightly browned. Slice into desired size with a pizza slicer or a sharp knife. I used a rectangle baking sheet to make my veggie pizza. I cut the pizza into 12 square shaped slices. If using a round pan, you will probably get about 8 - 10 slices, depending on what size you cut the slices into. Serving sizes will differ depending on the type of pan you use and size of slices you cut. This pizza is just calling my name, Julie! I absolutely love the combination of mushrooms and pesto. So delicious and definitely a nice change from the standard flavors! Pizza with pesto, I think I’m in love! I’m so glad you’re my pizza twin today — this looks AH-mazing Julie! Pesto on pizza is my absolute weakness! But piled high with all the veggies too?! This girl’s in pizza heaven. :) This looks just fabulous, Julie!! Thanks Sarah! I think pesto is becoming my weakness! I made an olive salad with it over the weekend and seriously, I could probably eat it straight from the jar! This is grown up pizza at its best girlfriend! 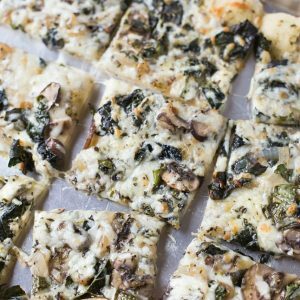 I think my kids could eat pizza every day and never get bored – I tend to not enjoy it that much, but I am in love with this veggie version!! Glad you like this version, Heather! I could eat pizza every day, too :) This is soooo my kind of pizza! Looks amazing! I live with someone who could eat pizza every day too! While I love it, I don’t like to eat the same thing all of the time which is why I love trying new flavor combinations. 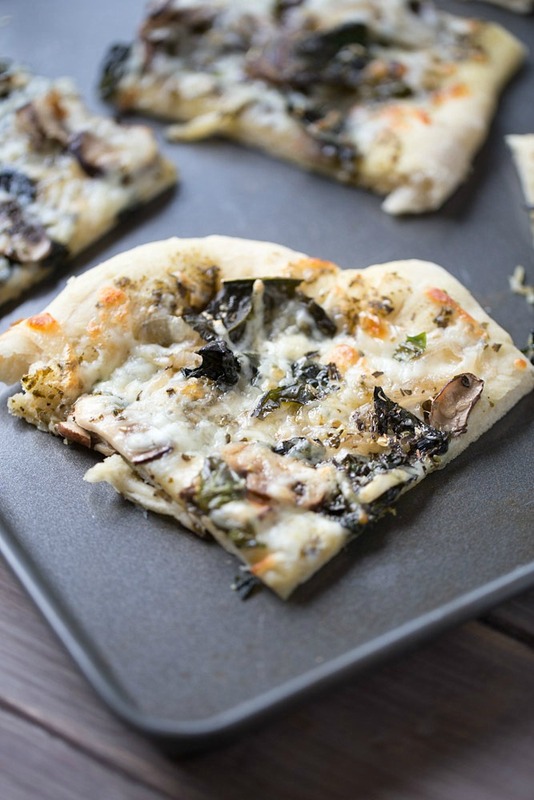 I love the ingredients on this veggie pizza and definitely need to add it to our rotation! Glad you like this flavor combo, Ashley! 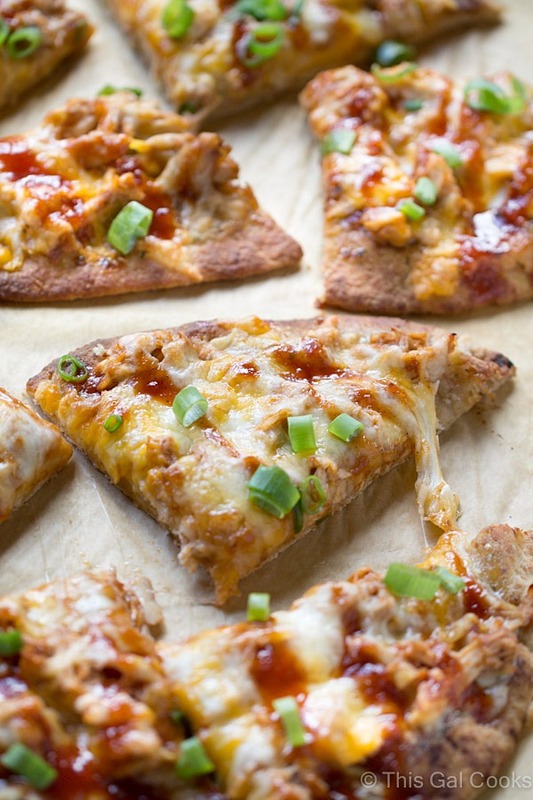 There’s so much you can do with pizza to get some great flavor combos! My guy is the same way! Love all the flavors you have going on in this pizza! 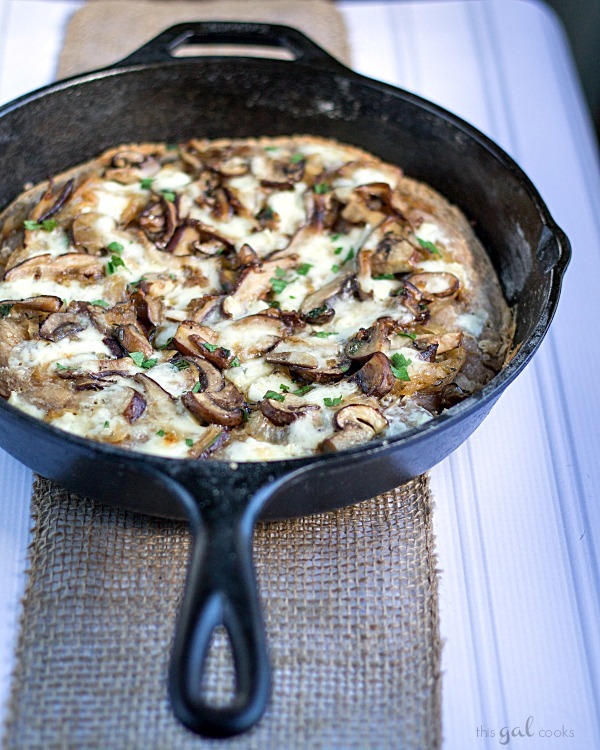 Julie, stop it right now – this looks TOO dang good. My word. We need to be neighbors.. FOR REAL! Pizza is always a favorite! This looks amazing! Definitely will share that method, once we get it figured out and perfected! We could totally live in the same house and never have problems with the food – your family and mine all love the grilled food, Mexican food and Pizza! YES! I can just imagine the flavorful goodness of this piza, my dear. Gotta try them soon! I live with one of those men that will eat pizza everyday too. This looks amazing and I love all the veggies!! My guy could eat pizza everyday too! Love how you changed up the flavors, the kale, mushrooms and pesto sound amazing!